A relation is a set of ordered pairs. In each pair, the first element comes from a set called the domain, the second from a set called the range. is related to if is a member of the house of . In this relation, there are six elements in the domain; four in the range and six ordered pairs in the relation. A relation is a broad concept, and can have some meaning that is recognisable or can seem quite random. 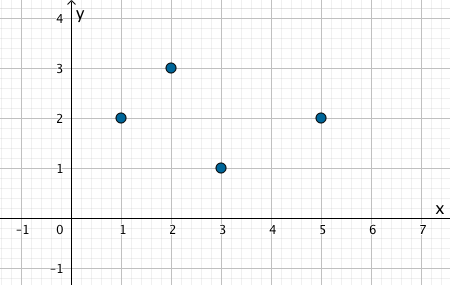 We can read the domain and range of a relation from a graph. The domain is therefore the set . The range is the set . We need only mention the y value ‘2’ once, even though it appears more than once in the set of ordered pairs. 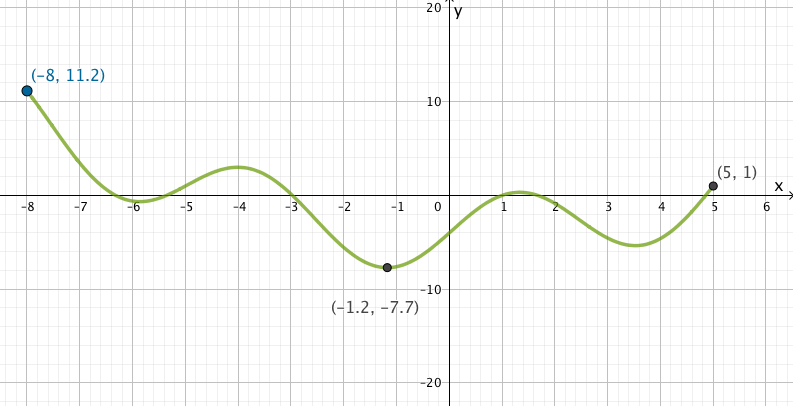 On this graph, we see a continuous curve. A continuous curve represents infinitely many points, so we can’t list them individually. The domain and range are also infinite sets – they have a max and a min each, but inifinitely many points inbetween. For the domain, we’re looking at the horizontal axis. In this case, the axis. We’re looking for the minimum value of and the maximum value of included on the set of green points that makes up the curve. For the range, we’re looking at the vertical axis. We’re looking for the minimum and the maximum value of on the green curve. Notice that we can read the domain from the endpoints, but the minimum and maximum values of y could appear anywhere in between the endpoints. Use the red dynamic point to find the max/min x coordinates and y coordinates. Write the domain and the range for each function. Solutions are on a pdf below the applet.